There are currently 3 users and 352 guests online. This is a minimally interactive randomly generated narrative experience. It's slightly inspired by old first-person role-playing games. It's also kind of dumb. I think you need java installed to play it. Enjoy! RPG game with 4 ending story depend in your selection in game. Also this is the first time I've tackled RPG Maker XP. This is my first attempt at making a RPG game at KNP, and it's pretty terrible. It doesn't have a save engine, so the game is quick-play. The controls are obvious. Defeat the evil judge in the sword of wrath! Or attack, please click on the button to save! Made in like 2-4 minutes. Also my return to KNP. In this five-minute game about Kierkegaard's philosophy, you make decisions and face a challenging test. Will you become the Knight of Faith? Complete quests and get loot! Grind for experience! Read the lore! Has everything a CRPG needs! Move with arrow keys, progress a conversation with SPACE or ENTER. Welcome to an original and exciting quest! A short, nonsensical dungeon crawler with randomized dungeons and a turn-based battle system. Made in a weekend in RPG Maker VX. 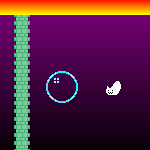 A lone slime battles the evil humans who destroyed his home in EasyQuest. Go tiny slime!